Drymax Run Mini Crew Socks, Black, X-Large (M11-13) by Drymax at Ultra Fitness Tech. MPN: DMX-RUN-08324-P. Hurry! Limited time offer. Offer valid only while supplies last. As a runner, moisture is your feet's worst enemy. Moisture causes blisters, discomfort, Athlete's Foot and allows odor causing bacteria to flourish. As a runner, moisture is your feet's worst enemy. Moisture causes blisters, discomfort, Athlete's Foot and allows odor causing bacteria to flourish. However you also know your feet are going to get wet, either from sweating, stepping in a puddle, running across wet grass or getting caught in the rain. You can even get splashed at a race water station and instead of the water going in you, it goes on you. The new Running Socks were designed with a special Dual Layer Moisture Removal System that moves moisture off the skin through the inner Drymax layer to the outer absorbent layer almost instantly. 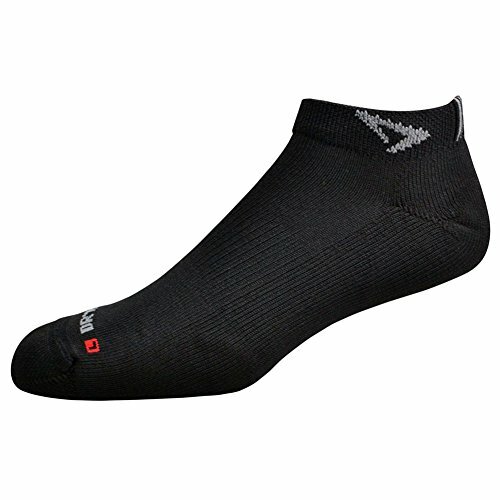 Our Running Socks are a Medium+ Density protective padded sock. We use dense padding, as opposed to thick padding, as it protects feet without adversely affecting the fit of the shoes. Our Running Socks were designed to be used in cool to warm conditions, keeping feet dry, comfortable and odor free.